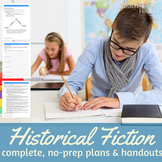 24 Writing Prompts to get kids started writing Historical Fiction. 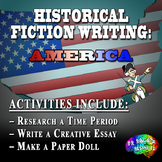 Most prompts deal with US History and are written to be used in an intermediate elementary classroom. 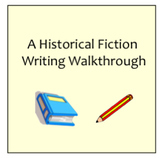 This Smart Notebook lesson is a must-have for your historical fiction writing unit. This product alone can walk you and your students through the entire unit. This includes an article, pre-writing samples, drafting samples, writing development strategies, several printables, and more! Enjoy! 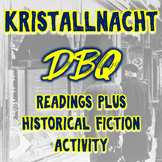 A unique book report project that combines creative writing, research, and personal response to literature. Includes an original printable assessment rubric and 2 pages of thorough, easy-to-follow guidelines that are ready to hand out to students. 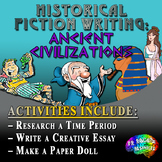 This activity is a fun way to include factual research about a specific time period with fictional writing. Students write a first person essay as a character type/person from history telling about his/her life during that time in the past. Essay must include factual information and show creativity. 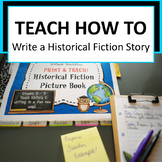 This step by step graphic organizer assists students in building a historical fiction narrative writing piece. 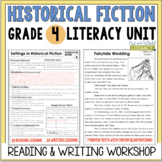 Mini lessons include inventing a historical fiction character, following story elements, using figurative language, and establishing a theme. 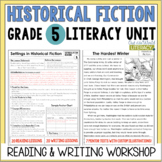 This is a writing checklist to help your struggling writers stay on task with the Expeditionary Learning Historical Fiction unit. Each bullet on the checklist corresponds with the rubric and lessons in the unit. These organizers are used to help students during the pre-writing process. 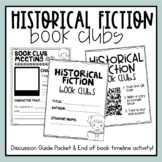 They include organizers that help students develop a character, plot, setting and historical dialogue. A writing assignment and story starter for Historical Fiction about the pilgrims.